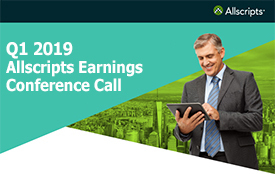 CHICAGO, Oct. 02, 2017 (GLOBE NEWSWIRE) -- Allscripts (NASDAQ:MDRX), a global leader in healthcare technology, today announced that it has closed its acquisition of McKesson Corporation’s hospital and health system IT business, known as the Enterprise Information Solutions (EIS) business. The transaction significantly expands Allscripts client base in U.S. hospitals and health systems and expands its solutions portfolio. Allscripts purchased the EIS business for $185 million in cash, subject to an adjustment for net working capital and net debt. Allscripts will invest in and continue to offer Paragon as the integrated electronic health record (EHR) and revenue cycle management solution for the small hospital market segment, while Allscripts Sunrise™ will continue as the primary platform for larger institutions, typically with highly complex service line needs. With this transaction, the combination of Paragon and Sunrise hospitals will double Allscripts’ current EHR hospital client count in the United States. EIS customers will now have access to Allscripts’ world-class population health management solution CareInMotion™, Revenue Cycle Management Services, post-acute and precision medicine solutions to improve patient outcomes and accelerate their transition to value-based care. Black Book Research released a report today featuring the result of a survey it conducted of many Paragon users who are now joining Allscripts growing client base. The full Black Book report is available here. Taken together, Allscripts’ comprehensive hospital, health system and physician EHR portfolio — plus solutions for value-based care, revenue cycle management, IT services, precision medicine and post-acute care — will help hospitals, health systems and physicians deliver on the promise of advanced and personalized care, with improved operational and financial performance. This press release contains forward-looking statements, within the meaning of the Private Securities Litigation Reform Act of 1995, that involve risks and uncertainties. Forward-looking statements provide current expectations of future events based on certain assumptions and include any statement that does not directly relate to any historical fact or pattern. Forward-looking statements can also be identified by the use of words such as “future,” “anticipates,” “believes,” “estimates,” “expects,” “intends,” “plans,” “predicts,” “will,” “would,” “could,” “can,” “may,” and similar terms. Forward-looking statements are not guarantees of future performance. Actual results could differ significantly from those set forth in the forward-looking statements, and reported results should not be considered an indication of future performance. Certain factors that could cause our actual results to differ materially from those described in the forward-looking statements include, but are not limited to: the expected financial contribution and results of the Enterprise Information Solutions business; the successful integration of the Enterprise Information Solutions business; and the anticipated and unanticipated expenses and liabilities related to the acquisition and the acquired Enterprise Information Solutions business. Additional information about these and other risks, uncertainties, and factors affecting Allscripts business is contained in Allscripts filings with the Securities and Exchange Commission, including under the caption “Risk Factors” in the most recent Allscripts Annual Report on Form 10-K, in subsequent Form 10-Qs and in our Form 8-K filed on October 2, 2017 under the heading “Forward-Looking Statements and Risk Factors.” Allscripts does not undertake to update forward-looking statements to reflect changed assumptions, the impact of circumstances or events that may arise after the date of the forward-looking statements, or other changes in its business, financial condition or operating results over time.